This line art has great potential, KAT! I would curve the roof of the samurai shed to give it a more oriental feel, but do as you wish. Oh, I love that. I laughed. It's awesome, the idea is just great. Damn, water and mountains are too hard for me, could somebody help me with water? Better perspetive now Thanks to bengoshia for link. Got rid of the fat look completely, still have no clue on what to do for the scene. KAT: If I may give some advice on your piece, try to go learn some basic perspective, this would help your piece alot(http://www.olejarz.com/arted/perspective/ Some one-point perspective). The water looks very odd, the best game I can suggest for water examples is the Metal Slug series(They're also pretty good with skies, most images on google are jpegs, so my suggestion would to be to go get the rom and emulator, use google to find this, don't really think I can give them out on this site, so I won't). 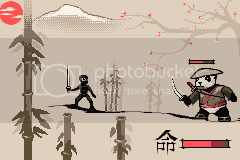 For the overall piece, you need more contrast and just better colors to fit the scene, so go google some stuff for reference and just look at other pixel art. 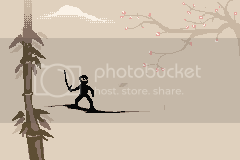 Kren: Looks great, could use some more dithering in places(Aswell as some good old Anti-Aliasing), add some more clouds, loving those and the ninja I think would look better looking more realistic, since everything else does. Oh also, the bamboo looks a bit odd, with it going from a fat bamboo to a small one. AlienQuark, maybe you should give the ninja longer legs, arms and torso so he looks more like the guy below him? He looks a bit like a child in a ninja costume at the moment. I love the concept, though. CroM, awesome stuff so far! bengoshia, the proportions of your ninja could use some work. He needs longer arms, shorter thighs, longer shins and broader shoulders, and his right arm (our left) would look more comfortable if you bent it the other way. You also have some very similar grays and the green tinted gray along with the blue highlight seems a bit random. 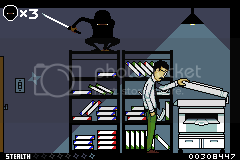 not sure where I wanna go with this, I'm debating what kind of game I could make. Dunno If I should consider it complete. BTW bengoshia, the white thing in the top is suposed to be a mountain, after your post I added more details =). CroM: I really like the environment, but in some parts the wood looks flat. bengoshia: the hands positions make him look odd, I like how the face looks. Earthpainting: You should add an enemy, That mockup looks really good, probably add more details to the sky like a moon and some stars ..